This is the design painted on the bus when they kicked off the party’s provincial election campaign a week ago. 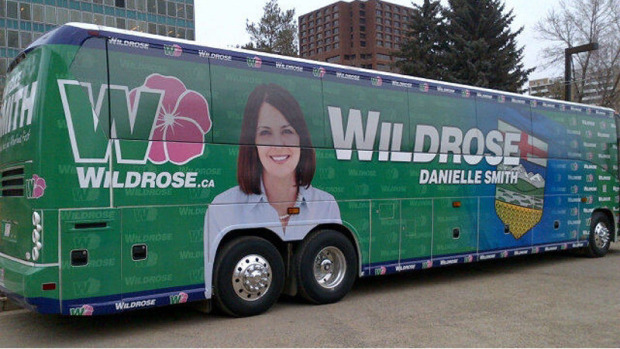 In the Calgary Herald it now says they have repainted the bus and located the leader’s picture more towards the middle of the bus. Most liked it the original way. It injected a little humor into the political arena. The Wildrose Party is a relatively new, but powerful party here in the Province of Alberta and they are hoping to knock off the long serving Progressive Conservatives. Wildrose is a right leaning party. The election will most certainly come down to a battle between Wildrose and PC both whom have female leaders interesting enough. You are currently browsing the WRITINGS & RAMBLINGS blog archives for March, 2012.